Transparency Market Research (TMR) has published a new report titled, “Parenteral Nutrition Market - Global Industry Analysis, Size, Share, Growth, Trends, and Forecast, 2018–2026”. According to the report, the global parenteral nutrition market was valued at US$ 5,299.5 Mn in 2017. It is projected to expand at a CAGR of 4.7% from 2018 to 2026. High prevalence of chronic disorders, rise in cases of malnutrition, and new product approvals are anticipated to drive the global market in the next few years. North America is expected to dominate the global parenteral nutrition market during the forecast period, followed by Europe. 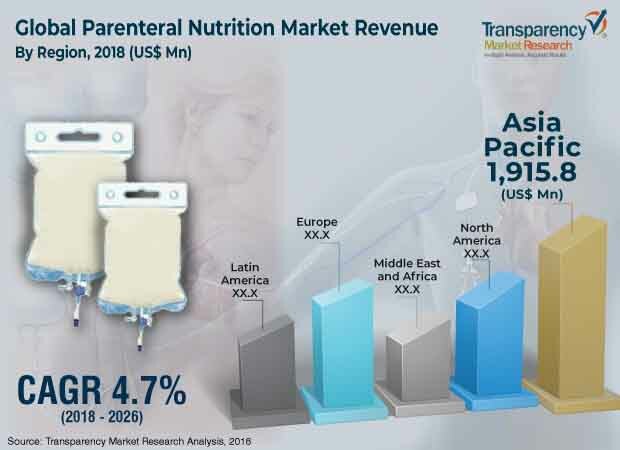 High prevalence of malnutrition in hospitalized patients, increase in the geriatric population, and approvals of novel parenteral nutrition combination in the U.S. and Europe are likely to drive the parenteral nutrition market in these regions during the forecast period. The market in Asia Pacific is projected to expand at a high CAGR during the forecast period.